1. 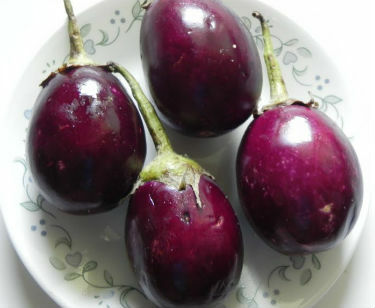 Score the brinjals without removing the stems and the base using a sharp knife. Do not cut all the way through. Just make small 1/4 inch deep incisions. 2. Combine the ginger paste, garlic paste, tamarind concentrate, garam masala powder, salt and red chilli powder in a bowl. 3. Stuff the brinjals with this mixture. 4. Heat oil in a pan over moderate heat. 5. Stir-fry the brinjals until cooked through. 6. Remove and serve hot with curd rice or with plain rice. Tip: You can also serve this as a snack. Feel free to comment or share your thoughts on this Brinjal Masala Roast Recipe from Awesome Cuisine.